After racing the Borealis I in the Formula Sun 2002 event to a 2nd place finish, the newly formed 2003 UMNSVP team realized that Borealis I was a promising car that was never truly finished. There were unrefined technologies and designs that could be taken to the next level of completeness. Built as an evolutionary design that stressed reliability and raced by an all-new race crew and two returning Borealis I team members, the 2003 team was the first of the UMNSVP to take 1st Place Overall in a race at Formula Sun 2003. By improving upon new technologies from the Borealis I car, the reliability of Borealis II came to be its defining characteristic. Borealis II not only gets its name from being the next car in the “Borealis” style of cars, but also due to its unique A-pillar windshield, which many observers pointed out, made the car resemble a B-2 stealth bomber. The Borealis II was unveiled at a biennial mock-scrutineering, where project advisors and UMNSVP alumni are invited to take a critical first-look at the new car. The team was again joined by NDSU whom brought their second-generation car (ASC 2003 Stock-Class 1st Place). The mock-scrutineers ask the student engineers details about their designs, their decision processes, and their final product. The Borealis II and Borealis I have similar shapes. The most notable change on Borealis II is the A-pillared and taller canopy, which allowed for excellent visibility for solar car standards. Increased shell and chassis rigidity, a more robust electrical system, and cleaner component integration and layout all were key factors in BII’s racing success. For the mechanical systems, the front suspension uprights were redesigned for ball joint re-orientation as well as improved fairing mounting and thinner front wheel assembly packaging, thus improving upon a tradition of having one of the most cleanly designed front suspensions in collegiate solar car racing. 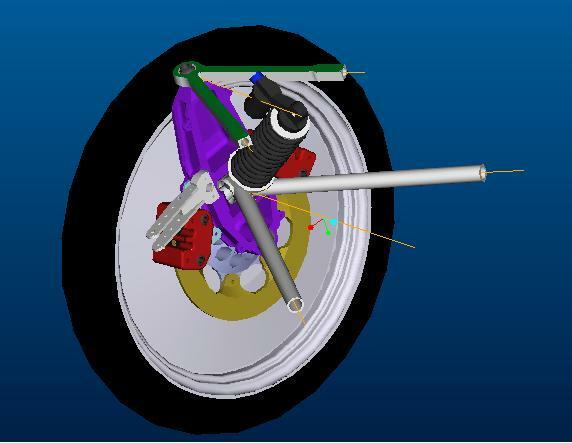 Suspension geometry optimization helped to greatly reduce tire scrub motion. The use of carbon fiber rods in the steering linkages also reduced weight. The rear suspension returned to a more classic swing arm design as used on Aurora 2 and 3. Another key design requirement that was met was that all electrical and mechanical components were held to the chassis without the use of duct tape, also known as “racing tape.” The only place duct tape used during racing was to fasten the wheel fairing access doors on. The driver ergonomics were also improved upon through enhanced control and display placements, and seat design. The electrical system saw a large increase in reliability with the motor controller, and most importantly, the custom UMNSVP-designed power trackers. There was only one time that the car had to pull over for electrical issues on the ASC race route, which is a great achievement. One could say the BII the first “plug and play” solar car for the UMNSVP. The solar array saw little change in the power output compared to the 2001 car, but did see improvements in solar cell module protection and production. Many lessons were learned and are being transferred over to the Borealis III 2005 Array Team. Getting ready to start the 2300-mile trek to Santa Clara, CA. Borealis II competed in three races in its short but bright career. It finished in 1st place at Formula Sun 2003 and followed that up with finishing 2nd in the cross-country ASC 2003 race. In line with the tradition of the UMNSVP, a new team led by returning 2003 team members also competed in Formula Sun 2004 and again made a 2nd place finish. 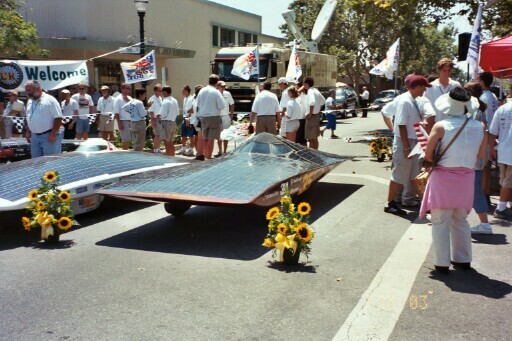 The goal of letting the new leadership and team members take the old car out was to learn hands-on about solar car racing and to give them baseline design ideas for their 2005 car and see how well or poorly the current designs performed. The 2005 team brought a record number of team members to the 2004 Formula Sun event and looks forward to contending for the 1st place honors at NASC 2005. Borealis II was the UMNSVP’s sixth generation car. The car went on to overcome adversity two months later at the American Solar Challenge, when damage to the chassis threatened to end the race for the team. The car and team pushed ahead with repairs and finished 2nd Place-Overall completing the 2300-mile route that started in Chicago, Il and ended in Claremont, CA. In May of 2004, the 2005 team composed of BII returning members and new team members took Second Place at Formula Sun 2004 in Topeka, KS. The ASC2003 winner’s circle displays from right to left Minnesota, Missouri-Rolla, and Waterloo.